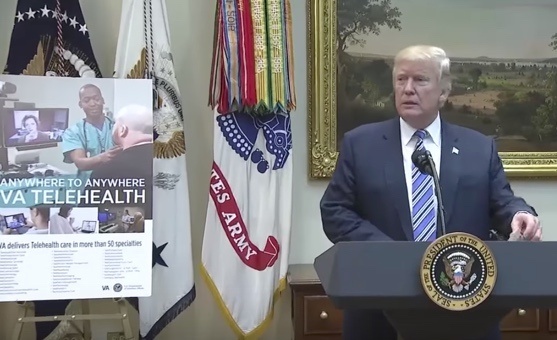 The President of the United States has announced a series of new programs to improve medical access for the nation’s veterans by expanding telehealth services within the Department of Veterans Affairs (VA). Telehealth — i.e., leveraging innovations in consumer technology to better connect patients with clinicians via user-friendly devices like tablets, smartphones and laptops — is already an integral part of the nation’s VA centers. More than 700,000 veterans utilized the VA’s existing telehealth services last year, as Secretary of Veterans Affairs David Shulkin explained at a White House unveiling of the new initiatives. "I expect this to dramatically increase our numbers from 700,000," he added. President Trump, for whom the prospect of improving care for veterans was a major campaign talking point, also pointed out that the new initiative would be used exclusively for appointments within the VA healthcare system, and not outside of it. As patient wait times at VA centers continue to be a source of frustration for veterans, many are opting to utilize the Veterans Choice Program to extend their benefits to private care providers. This NPR report about a “typical” VA scheduling experience illuminates the crises of patient wait times and the need for expanded mental health and suicide prevention services all in one tragic story. In addition to his role as Veteran Affairs Secretary, Shulkin is also a practicing physician who still sees patients in a Manhattan VA center, as USA Today reports. Despite this commitment to traditional medicine, he’s also reported to be focused on expanding telehealth as a means of “removing geography as a barrier so that we can speed up access to veterans and really honor our commitment to them,” as he said at the announcement. “This is all part of our modernizing the VA," he added. The ceremony included a demonstration of a telehealth call with a veteran, as well as video conferencing demo with a physician in Oregon. You can watch the event in its entirety here. Interested in learning how telehealth and RPM services can help your organization achieve greater efficiencies in care? Contact us here to schedule a complimentary consultation with a Care Innovations representative.